Go back about 10 years or so and Ladakh was necessarily a place for adventure junkies or motorcycle enthusiasts. Those days however are of past. Tourism here is on rise and the number of people visiting rises with each passing year. People have now started to visit Ladakh with infants, toddlers and children under 2, 3 or 4 years of age. So if you were wondering whether or not it is doable then the answer is that yes it is. But you must keep in mind a lot of things and prepare accordingly; details on which I will provide in this article. Before I continue writing this article any further, let me first mention that I am not a Doctor or a medical professional. I have no experience in the file and the details I am sharing below is just some practical knowledge that I have gained from all my trips to Ladakh in last few years. This is one of the most common doubts that people traveling to Ladakh with family have; so let me begin with addressing this question first. There is really no age limit for Ladakh as long as there is no medical history or condition involved. With that being said, personally I would not prefer taking a child along on a journey to a high altitude area like Ladakh unless they were at least a couple of years old. And you must not do it if the child is below 3 months of age. As mentioned in the article HERE, Babies under 3 months of age do not have mature enough lungs to handle altitude sickness; so if you kid is yet under 3 months, trash the plan for another time. If your baby was born premature or has a heart or lung condition, it is highly advised that you do not bring them along on the journey or at least consult a doctor before you do so. Almost everyone who travels to Ladakh for the first time suffers from acute mountain sickness; with an exception of people who have been to similar high altitude areas before. Problem with traveling a child is that it is hard to identify signs of AMS with them. If your child is of a few years of age, they would still be able to tell you if they aren’t feeling well; but if you went to Ladakh with toddler or infant, you will have to be strictly vigilant of their behavior all the time. Acute mountain sickness is a direct result of exposure to low oxygen levels due to gain in altitude. In order to compensate for low oxygen per breath, our body increases the breathing rate. This process of our bodies adapting to low oxygen and high altitude is called acclimation. In short, high altitude sickness occurs when our body is not able to get the amount of oxygen it needs from the air. It usually occurs at an altitude of 8000 feet or higher and anyone from adults to children can suffer from altitude sickness. Depending on the symptoms, sometimes altitude sickness may be as simple as a headache; or as severe as a condition called HACE that can be fatal if not treated in time. Children have the same tolerance level for high altitudes as adults, with an exception of babies under three months of age, as discussed above. A better option would be to wait until your child is at least 1 year to 18 months of age. It will make things easier for both you and the baby. If your baby has altitude sickness, he or she may vomit, appear more tired or irritable than usual, not sleep well, loss of appetite and seeming generally unwell. Being at a high altitude may make your baby tired and dehydrated. He may also have a headache and feel dizzy, although he won’t be able to tell you how he’s feeling. When it comes to babies, be mindful of the non-verbal signs. The symptoms of altitude sickness in babies can manifest immediately or after a few hours. Older babies may complain of dizziness, fatigue and other symptoms. Now what I mentioned above was purely in terms of Altitude sickness but that is not all. There are a few other things as well that you will have to be mindful of as mentioned below. In case of an infant,my first advice would be that Ladakh should never be your first trip with the baby. Travel to a few other places first, the easier ones. This way, you will get an idea and experience on how to travel around with the baby; and will also know how to take care of your infant better. If you are completely new to parenting, then Ladakh cannot and must not be your first vacation after child birth. You should also get used to using baby gear while on the move like car seats for babies, baby carriers and booster chairs. You must keep your baby hydrated at all times. Nurse your baby frequently or offer several additional ounces of formula or water daily while you remain at the higher altitude. Another problem could be putting your infant to sleep at high altitude. Keep them warm, comfortable and offer sips of an electrolyte solution to keep them hydrated. This will help the baby sleep. Your child may start to sleep in short duration but more often. This is normal as long as they are getting enough sleep everyday. Last but not the least, you must also allow your baby time to adapt to higher altitude so plan a trip with frequent stops along the way. Do not rush through the journey and ensure that gain in altitude is gradual. Items like Diapers or warm milk will not be available at all the places. You will be traveling through a remote region and you may struggle to find food that your Baby can eat. So please ensure that you are packing well and in sufficient. Another thing you need to know that at most of the places, you will not get a regular pediatric medical care. Leh is the only place in Ladakh where a well-equipped hospital is available. So before you start from home, visit a Doctor and bring along any necessary or precautionary medicines that they recommend. When it comes to adults, I always suggest to travel light; but if you are traveling with children, I would rather recommend that you bring anything that you think can come handy and you can carry comfortably. Bring in plenty of snacks like chips, biscuits etc. that your child can keep munching on. If possible, bring an electric kettle along. Feeding ice cold water to a baby at night may not be a good idea and you can’t wake up the hotel staff for warm water every time your kid is thirsty. It will also come in very handy if you were traveling with an infant when warm water will definitely become a necessity. You can use it to heat up some milk as well if needed. Your gain in altitude must be gradual or slow. If you were going to Ladakh by road, then I will strongly suggest that you take the Srinagar route to reach Ladakh and return via Manali. Even while doing that, stay in Srinagar for a day or two so that your child’s body can get ample time to adjust to high altitude. Srinagar Leh highway can be done in two days easily but with a kid, it is advised that you give it three days. Reach Sonamarg from Srinagar, stay there for the night, proceed to Kargil on day two and then to Leh on day three. Taking the journey slow is really the key here. Altitude sickness usually occurs at an altitude of 8000 ft or higher so the idea is to first stay a couple of nights between 8000 to 9000 ft and then gradually increase the altitude. If you are planning to take Manali Leh highway, then you must stay in Manali for at least a couple of days. On the next day, stay at Keylong or Jispa. I highly advise against staying at Sarchu or Pang because it is even at a higher altitude than Leh and most people suffer from AMS here. Also, do not include Tso Moriri while on your way to Leh as this lake is at even a higher altitude. Drive straight to Leh from Keylong / Jispa, stay there for couple of days and then plan to visit nearby areas accordingly. Children by habit move around a lot. They are bound to get excited when brought to a new and exciting place; and they may start to run around. If tired or get exhausted, they will be at risk of triggering symptoms of AMS and will fall short of breath. Control their movement and do not allow running, climbing or other exhausting activities. Your body’s fluid requirements are increased at higher altitudes and same will be the case with your child so you must keep them hydrated at all times. Ensure that they are consuming enough quantity of water or juice but also do not over-hydrate; and by that I mean to force the child to drink more water just because you want to keep them hydrated. If the child is not thirsty, do not force them. Another option would be to offer them some juice if they do not want to consume water. Do not also force feed your child. Digesting food at high altitude can be a time consuming process with low oxygen and you keeping your babies movement in check. So if your kid is not hungry and don’t want to eat, do not force them to. Take extra precautions with the child in terms of protecting them from cold. Children tend to catch cold easily and if that happens, you will be in a bit of a situation because traveling to Ladakh means limited medical facilities and no medical facilities while on the road. Always keep your child well covered and carry an extra layer of woolens. Even in the months of June and July, weather of Ladakh remains cold and temperature will drop drastically at nights. Ensure that you do not let your child out early in the morning before sun is up; and do not let them stay outdoors once the sun starts to go down. Dry skin and chapped lips can happen due to the cold environment and dry air. Carry a cold cream, a lip balm and apply frequently. Harsh Sun would be another one of your concerns. Even adults can get serious sunburns in Ladakh if they weren’t careful so you can image what would happen to a child if you left them uncovered. A sunscreen lotion with highest SPF will be one of the necessary items to pack. Ensure that your child is fully covered at all times. Bring full sleeve clothing to protect their arms, socks to protect their feet, gloves to protect their hands and a large enough hat to protect their face. Sun rays are really strong at high altitudes which may cause irritation in eyes with some children so using a shade would be a good idea. When traveling with an infant, there are a few other things that you will have to consider. Is your baby breastfed; or on a formula / mixed fed diet? On the trip you will come to know that traveling with a breastfed baby is actually easier; except for the times when the child may ask for a feed at awkward times and places. If on a mixed diet then your baby will also start to depend more on breast milk and will reduce intake of solid food. You will also them to start refusing water as well and ask for milk instead. This is completely normal as long as you are nursing your child regularly. Have you introduced solid food to your baby’s diet? And if yes, how well have they taken it? Has your baby already crossed the initial poop related hurdles like upset stomach, lose motions, constipation etc after introduction of solid food? If your baby is of Formula milk then please ensure that you are carrying enough of it. You may also want to bring some packaged Baby food because fresh milk and vegetables are rare in Ladakh. The hotels mostly use the powder milk and fruits / veggies are mostly stocked for several weeks ahead. I would also advise asking your doctor about feeding Formula milk to your child at such an altitude because it is heavier than Breast milk. As I mentioned earlier in the article, you need to keep your trip to high altitude areas short. Do not stay at top of the passes for a longer duration. Stop there, click a few pictures and be on your way. Do not spend too much time on the top with a child. If your baby has an ailment related to heart or lungs then my advice would be to not bring them to Ladakh. Same applies in case of an infant born prematurely. Even if there is no medical history, consult with child’s physician still about your kid’s ability to tolerate the altitude. If there is a medical history involved, please do not forget to bring all the required details reports along. You should also consider that your access to doctor or a clinic will be severely limited. If help wasn’t available, even a simple toothache or upset stomach can turn into a major problem with a child. To be better prepared for this, consult your child’s pediatrician before departure and carry any medicines recommended by the doctor. Some of the common medicines to bring are for fever, cough, cold, medicines to stop vomiting, breathlessness etc. Diamox is a well-known medicine against AMS but please do not administer it your kid without asking a Doctor first. Diamox is a blood thinner and while it helps prevent altitude sickness and breathlessness, it can have its side effects as well. A homeopathic medicine called Coca 30 is available as well for altitude sickness which sounds like a safer option with kids but once again, ask a Doctor. Do not administer any medicines into your baby without professional advice. ORS packets will be a great item to bring along specially if you were traveling to Ladakh with toddler. Have your child drink this with water to make sure that they are getting enough minerals even if they weren’t eating like usual. Garlic is known for two things, both of which can be helpful while experiencing AMS. First is that it thins the blood and enhances the circulation. Second is that it helps the body use oxygen more efficiently; which reduces breathlessness at a high altitude place like Ladakh. All you need to do is to peel off 2-3 garlic cloves and start chewing on them. Breathing through camphor (Kapoor in Hindi) or garlic helps reduce breathlessness. Clove is another natural home remedy that helps the body to be more efficient while using oxygen. You must keep a close watch on your child’s behavior. It is not easy to identify symptoms of AMS in the baby as they are non-specific at first but some of the common symptoms are trouble eating or sleeping, becoming unusually irritable, crying too much in case of infant, change in skin color, headache, dizziness, fatigue or difficulty in breathing. If you notice any of these symptoms, your must immediately descend to a lower altitude. If you are visiting any of the nearby areas around Leh and the child continues to show symptoms of AMS, you must immediately return to Leh to get medical attention. Vomiting a couple of times is normal for children so if that happens, you have no need to panic or worry. It doesn’t necessarily have to be AMS; could just be motion sickness with all the driving up in the hills on winding roads. Just give some anti-vomiting medicine and that will do. And I mean it in the best way possible. Please do not run after your child everywhere. I have seen parents (specially mothers) doing it. You are just making the trip less pleasurable for yourself and annoying for your kid. I am not saying that you should not keep them safe or protect them but do not overdo it. All of your are on a trip so let them enjoy themselves too. Do not get up and run every time your child starts to walk away from you. Do not try to sanitize everything around your baby. Biggest problem with a child that young is that they will not be able to tell you exactly how they were feeling. You will have to keep an eye on them at all times and be vigilant of their behavior. Pack plenty of Diapers as you may not get these at all places. Carrying an electric kettle would be greatly helpful. Keep your baby hydrated and nurse frequently. It will pretty much be the same deal as I mentioned above but a bit easier. Carry plenty of snacks at all times that your kid can continue munching on. Restrict your child’s movement and do not let them run around and exert. Keep them indoors early in the morning or as the sun starts to go down. Keep them covered and protect against cold and Sun. Keep them hydrated and continue serving water at regular intervals. Carry some milk and if you baby refuse to eat regular food, have them drink some mil and munch on snacks as much as they want. Keep your child covered at all times and do not allow them to exhaust themselves or stay outdoors during early or late hours. You should be OK traveling to Ladakh with a 4 year old Child; or older than that. Just do not let them get too excited and keep their movements in check. I have this friend whose 5 year old Son almost ran off a cliff at Khardung La. With a child that old, they will be able to communicate better and tell you if they weren’t at east. I hope all this information was helpful; however I strongly suggest that you consult a doctor before taking your child along on the trip. These were just some general suggestions provided by someone who has no medical knowledge and is no way an expert on AMS. If you have any further questions, please feel free to ask in the comments section below; or at our Community Forum; and I will be glad to answer. sir we are planning to go to leh in 24th of nov 2018 whether it is correct ?? kindly let me know? You can plan the trip at this time, can also do sightseeing but I won’t really call it the best time for the trip. It is going to be extremely cold so pack accordingly. We are planning a Leh trip in mid-September via Srinagar to Manali with a 4-year kid. Is it safe??? It should be but I will still advise you to visit a Doctor before the trip and get a professional opinion as well. Hi Vargis , This is Ranjit .. I was thinking for leh laddakh trip . I will be accompanied by my 3 year old daughter .. During our past experiences we have noticed tha at hilly terrains my daughter has a tendency to vomit rather I would say. if we feed her with milk in the breakfast she vomits it during our travel .. my wife says it is motion sickness and I think it is normal . Kids do that ..
Actually also if you give a green signal ..
Then how many days trip I should consider in the month if september ..
And also I would like if u send me a link of the itenary for the same ..
Hi Ranjit – She could be suffering from both motion sickness and AMS. I have not seen many people vomit because of AMS though. AMS feels like you are running a really high fever so the date with your daughter could be motion sickness. But to be honest Bhai, my reply here would only be guesswork which I do not feel as the appropriate thing to do. Please bring your daughter to a Doctor and get a professional opinion. They would be able to tell better with some other tips on what can be done. About your trip and itinerary yes I can help. How will you be traveling and from where? I was also thinking of the same trip .. my only concern is my daughter’s health .. If you start from Srinagar and give it 2 weeks of time then I do not think AMS would be a problem. Just keep her well hydrated, protect her from cold and sun and don’t let her exhaust herself and she should be OK.
Do you have any advice for a mother with 4 year old kid. Husband is not able to join because of his work. Is it safe to travel alone in hired cars? We will be coming by flight and max 5-6days trip.thank you. It is pretty much what I covered in the article above. Traveling alone in rented taxi should be OK, a lot of women travel solo to Ladakh each year by public transport. From all the feedback I have received from them so far, it is quite safe to travel. Hello Vargis Bhai – I am planning a trip with my family(including 4 yr son of mine) via Manali (roadtrip) in September 2018. I plan to stay overnight at Manali, next day to Jispa( stay overnight) and 3rd day to Leh. Let me know if I should Carry an oxygen cylinder on the safer side and which one, if so? Also pl suggest if there is a problem with my plan of 3 days travel…Also to set the context here, my son travelled to Rohtang pass when he was 2 yrs yrs old and we spent couple of hours there and he was perfectly fine. Oxgen Cylinder is not really required unless someone in the group has some breathing related ailments. On a safer side though, do not spend too much time on top of any pass in between if anyone complains about breathing, headache or starts to feel feverish. With that being said, I will HIGHLY recommend that you consult a pediatrician and take his professional opinion on some tips. Your 3 days plan is fine but make sure that you start from Jispa by first light of the day, it will be a long journey. Understood buddy 🙂 , thanks a lot . 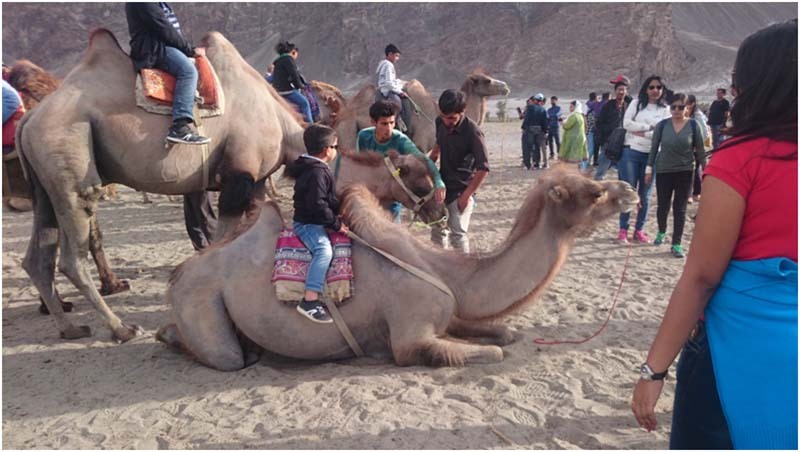 Guess you are referring to the kid’s pic riding a camel in Nubra…relief and confidence building measure. Thanks again for this Vargis bhai. I admire your immense knowledge of the region and would take your liberty to ask couple of more questions..Kindly consider…1) Where should i stay in Jispa and approximate charges? 2) Any good and reasonable taxi service/guy who can take me from Manali to Leh. You are welcome Amit Bhai. At Jispa there are a couple of camp sites you can stay at. Approximate charge would be about 1000 per person. Or you can halt at Keylong. There are not many hotels at Jispa as compared to Keylong. I am sorry but I do not know any taxi drivers in Manali. Thanks a lot Vargis Bhai. Appreciate your immense knowledge and honest attitude. You are welcome Amit Bhai. Do let me know how you trip went after returning and don’t forget to share some pictures. Amazing Vargis bro…..I had dis doubt and even posted it in one of the blogs but got my answer in one of your blogs only..must say you are an aswum blogger..nd your blogs are highly commendable and appreciable..a big thumbs up to all your blogs..keep blogging..dey matter a lot.. Thank you so much for taking the time to drop a note Puneet Bhai. I am glad that the information was of help. Hello – Sorry I completely missed responding on our comment. Please let me know if you still need this information. Thank you so much for taking the time to drop a note and appreciating. Hi, very informative blog I must say. I am planning to go to Leh via Manali (mid June this year) with my friends and two kids 8 and 10 years. We’re staying 2 days at Manali, then Keylong for a day and then to Leh. One day rest at Leh and then visit Nubra n Pangong Tso and back to Leh. We adults in our early 40s. Do you think the plan is ok and what else do you recommend for us. Thanks in advance. Regards, Prithwiraj. Hi Prthwiraj – Thank you for your appreciating words. Your plan seems great. You are giving sufficient time in between and I am sure will not have any problem anywhere. Just make sure that you keep the movement of your kind under check and not let them run around and exhaust themselves. Hi Prithwiraj – Sorry I missed responding on this comment of yours. Please let me know if you still need this information. whether we should stay in pangong tso overnight with 7year child. Camps are quite comfortable and warm so you can stay there. If not, then there are some wooden cottage as well. At the Spangmik village you have the choice of staying as paying guest. There are a couple of guest houses at Man and Merak villages. Please take a look at the article below. If you question was in terms of whether or not to do it, then it really depends on the mountain sickness factor. If you have spent enough time at Nubra and Leh city and your child shows no signs of discomfort then by all means stay there. If your child starts to feel unwell while traveling to the lake or at the lake, then return to Leh city. But make sure that you make this call latest by 2-3 PM and start on your way back. Thank you for your kind words Pavan Bhai. I really appreciate it. God Bless you and your family !!! From Delhi to Leh by flight if I go, what should I do at Leh? Any problems may occur at Leh?